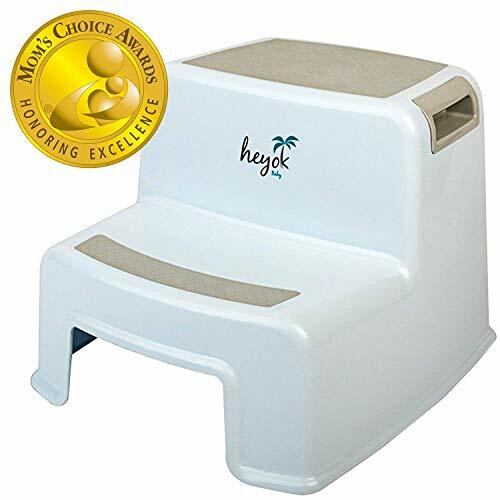  WINNER OF THE PRESTIGIOUS MOM'S CHOICE AWARD - Our Kids Step Stool is a recipient of the prestigious Mom's Choice Award. Around the world, parents, educators, retailers and members of the media trust the MCA Honoring Excellence seal when selecting quality products and services for families and children. ⛑️ TOP SAFETY FOR YOUR DEAR - Think before you order a plastic step stool for your little heart, does it has all the safety features you want it to have? Our Toddler Step Stool has new upgraded anti-slip rubber pads so your kid will NEVER slide on it and hurt themselves. It has no sharp edges and has anti-skid feet for best stability. Order it today and try it RISK-FREE with our Money Back Guarantee. ️ EASY TO USE, QUICK SETUP & VERSATILE - Potty training and teeth brushing can be difficult for little kids, especially when their balance is not fully developed. The kids Step Stool is perfect for the bathroom, kitchen or the kid's own room. After use simply place it aside, It's lightweight so your toddler can easily carry it themselves. it's versatile and can also be used as a seat.  FREE BONUS eBOOK INCLUDED - You will not only receive our premium Dual Height Step Stool for toddlers, we also added an eBook with educational colorful pictures and story that shows your toddler how to use the step stool. This amazing eBook is funny and easy to understand for any kid, toddler or child.  OUR PROMISE TO YOU - You are backed with our EXCLUSIVE 2 Years Money Back Guarantee. If you or your toddler doesn't like our Brand New Dual Height Step Stool, simply contact us for a FULL REFUND. No questions asked!